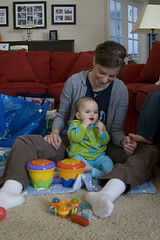 Mia has an occupational therapist that comes out to the house every other week to work with her on fine motor skills. Annie has been coming now for about 5 months. With the recent holidays and snow she hadn't been out in about a month. She made it back last week and was very surprised and excited about how well Mia is doing. Mia hasn't tollerated her sessions with Annie very well. A couple times the session was cut short simply because Mia had had enough. Last week Annie reported Mia did very well! She's rolling back and forth from stomach to back and back to stomach on her own. She's able to get on hands and knees while reaching for toys and rocking. While sitting she is able to reach in all directions while maintaining balance. She's enjoying banging objects together, retrieving objects from a cup, bringing objects to her mouth and passing objects from hand to hand. And last but definitely not least her shakiness is down and her balance is up. Woo hoo... go Mia! 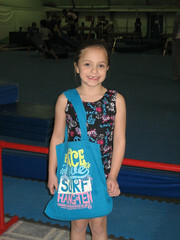 Last tuesday was Hannah's first day back to gymnastics this year. She was very excited, especially with her new gear she got for Christmas! 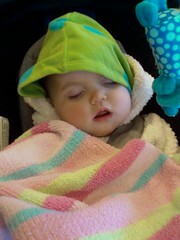 Tuesday we took Mia in for an MRI focused on her brain and a visit with her Neurosurgeon. We were looking for three things. One, have the plates in her head fussed prematurely. Two, is the shunt placed and working properly. Three, how is her brain developing. On the positive side the shunt is working well and the Dr. isn't too concerned right now about the plates in her head overlapping and prematurely fusing together, which means no surgery at this point. On the flip side it was a reminder to us that even though she is doing so well, there are a couple specific internal parts of her brain that simply don't exist and that the back half is still connected when it shouldn't be. The findings are still consistent with Semi-Lobar Holoprosencephaly. Scan or no scan the doctors have consistently told us that the best way to tell how she’ll do when she’s older is whether or not she hits her developmental milestones. And so far so good! She is now 8 months old. She is very attentive, sleeps well, eats well (baby cereals and food), rolls over, sits up on her own, picks up toys and moves them from hand to hand and is just as good and happy as they come. We had a great time at Wana Waves last week. We spent two days in Shipshewana Indiana at the water park hotel. As snow fell outside we enjoyed the 84 degree warmth inside. There were lots of slides for all the kids to have a great time. We got there on Monday afternoon and left late Tuesday. The rooms were amazing. They had a queen size bed in one part of the room. Divided by a partial wall was another area with two sets of bunk beds for the kids. Then the bathroom area in the front. Very ideal for a family. 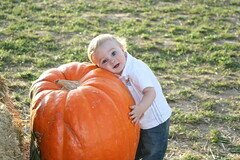 We ventured out to the pumpkin patch a week ago. Here are a few pictures to go with the trip. Rather than write about our vacation I just posted a bunch of pictures to our Flickr account all tagged with 'stlouis'... enjoy! Our blog is meant to share recent experiences with our family.